These marine paintings that have come to be known as “The Trafalgar Collection” started life when I was invited to become ‘Official Artist’ for HMS Victory’s 2005 Trafalgar bi centennial anniversary renovation. The images to help raise funds for the ship and the Royal Navy Museum, Portsmouth. 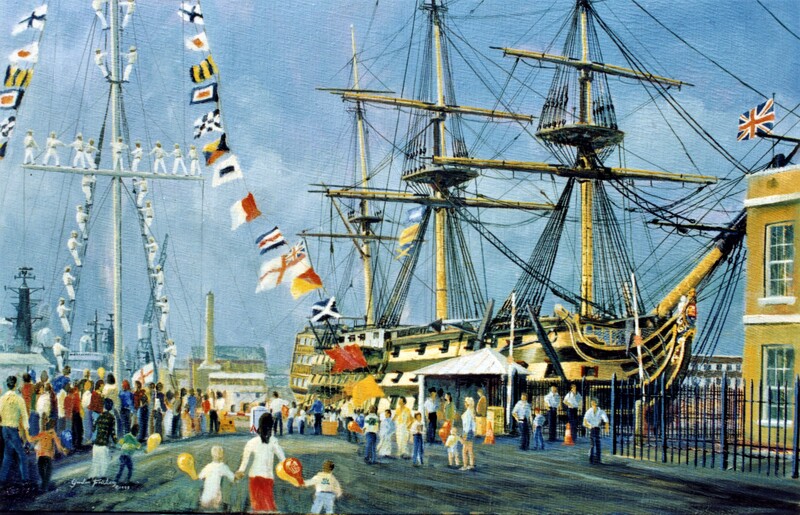 Hyperlink > Dockyard 400 , one of The Nelson & Trafalgar Collection, available. The project was aimed at raising awareness of HMS Victory thus funds. To illuminate what she represents as a world heritage artefact, the only surviving First Rate Ship of the Line of Battle and to raise funds to help facilitate HMS Victory‘s renovation, inside and out, a project headed, supervised and researched by the now legendary Mr. Peter Goodwin, HMS Victory‘s ‘Keeper and Curator’. In that we were successful. Hyperlink > Nelson & Trafalgar Collection, “H.M.S. “Pickle”, carrying the news of the Battle of Trafalgar. printed on cotton canvas, numbered, signed and framed to be presented at their Trafalgar Dinner 2006. The Trafalgar Messenger , one of The Nelson & Trafalgar Collection, available. HMS Pickle, of a reproduction HMS Pickle, Cape Trafalgar to Falmouth, Cornwall (now based at Hull and operated by Captain Malcolm Nicholson) with duplicate ‘Trafalgar Dispatches’. I heard later the dinner was a great success completed with singing Admirals and the Princess was “thrilled, over the Moon” with her gift. Timeless paintings, royal gifts, the test of true greatness, classic paintings, the of best long term fine art investments. My brief was to paint some of the interesting but less well know aspects of the stories of Nelson, HMS Victory and the British Georgian Navy. I was given a letter of introduction by her then Captain, Mike Cheshire. My task and the letter opened doors, draws and archives in Britain, France and Spain, not normally accessible and revealed a more interesting more balanced picture of those times than is generally portrayed. I was able to help the work of Peter Goodwin in some surprising ways. He and I remain colleagues and firm friends to this day and beyond. With the hindsight given us today one can now see that period in our lives was a once in a life time event. Many archives and museums opened for me, including sources no scholar had investigated, I particularly think of those I visited in Paris, Brest, Madrid, San Sebastian Naval Base and Cadiz. Aside from the body of completed works, those days have left me with many stories and much as yet unused information; ready for more adventures! Paintings in the Trafalgar Project have been moved to the War Ships section. This page has been retained in the Archive. 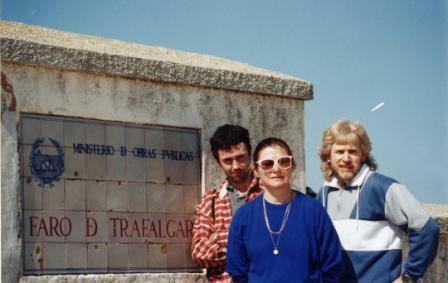 For an explanation of the Trafalgar 1995 to 2005 Project read the text below and see these images. 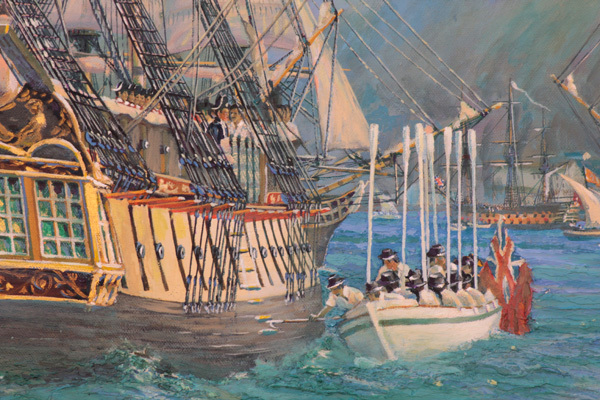 NEW – Very few of these extraordinary Trafalgar paintings on this site have ever been exhibited or used for any ‘commercial purpose’. A few have been seen on TV and appear in a number of authoritative books. They are all memorable and historical documents, significant Trafalgar paintings. There is also some fun and mischief to be seen, my friend, the famous yachtsman Sir Robin Knox-Johnston was the model for the boson seen in the eyes of the schooner HMS Pickle is an example as is a more accurate redefining of the traditional version of Nelson’s tactics at Trafalgar. “Trafalgar Dawn” you are with the crew of H.M.S. Victory at 06.05, Monday 21st October 1805. This Project was exclusive for HMS Victory, the roots going as far back as 1993 soon after which I had the privilege of unlimited access to Nelson’s famous flagship. The paintings were and are intended to be part of a project to raise money to support the preservation of HMS Victory and the RN Museum Portsmouth. In that they are successful. The paintings, some now sold have never been publicly exhibited. A core of some 15 paintings remains to which from time to time I add another, it seems a pity not to use my extensive notes, research and knowledge so as and when, I do. As I write, the newest addition is “HMS Racehorse”, painted for the new book”Nelson’s Arctic Voyage [Bloomsbury Press, London, out soon. Some remain unfinished (“Death of Nelson, a French marksman’s view” and “The Carronade “). The brief was to look at the less known and unusual but interesting aspects of the Nelson and Trafalgar story. From the outset I appreciated most of the new Trafalgar pictures would be quite predictable, the big ships going into and in action etc. So it proved to be in 2005. My approach has deliberately given a more intimate and daring view than is normal; were possible to place you the observer in close (“H.M. Schooner “Pickle”, carrying the news of the Battle of Trafalgar “) to or even among the crew (“Trafalgar Dawn” ), this by working directly from first hand accounts, visiting locations, researching extensively and to use my experience as a qualified photographer, under sail, as a master shipwright, an historian and of course as a painter. The margin of the prints “Trafalgar Dawn” and “Trafalgar Dawn The French Perspective” includes a sketch of the combined fleet, named in the (probable) order of sailing at 06.05 hrs based on the reports of the officers present. HMS Pickle shows a self-portrait of the artist working among the crew and his friend the famous yachtsman Sir Robin Knox-Johnston was the model for the boson seen in the eyes of the schooner. When I began to work on my series of paintings about Nelson & Trafalgar (“Nelson’s Column “) in 1995 I realised as I read more deeply, that the direct evidence of the enemy, much ignored & dismissed by British sources, was important. The traditional British perspective of the French and Spanish of that time is seriously flawed. This unfashionable view he discovered was surprisingly shared by the Admiralty appointed Committee of 1913. I concluded, the traditional version of Nelson and Trafalgar as shown including on recent TV programmes is wrong, and there is a general misunderstanding of Nelson’s tactics as proven by a careful reading of Victory coming under fire and an understanding of how square rigged ships handle (see “First Shots, Trafalgar “). At my own expense I travelled to Brest, Paris, London, Liverpool, Madrid, San Sebastian Naval base & Cadiz, visited Cape Trafalgar and researched the Battle of Trafalgar as extensively as then possible, studing source material before putting paint to canvas, see Some Sources consulted included. Much of my work is available in fine art quality print on canvas for the look and feel of the real thing. If it is not in limited edition it can be printed, for a reasonable price for your special order; one off, signed, open edition – this was impossible 3 years ago, an example of new technology and very reasonable prices working in your favour. Special thanks go to my principle sponsors Nic Varley, David Ellinghan and John Mitchell for their ability to bring on my talents, their faith in me. Also to the good people of the Plymouth Twinning Office and to the Office des Jumalages et Relations Internationales de la ville de Brest, the Naval attaché of the Spanish Embassy in Paris, to Mr. John Smith former head of department, Plymouth Naval Reference Library, M. Jean Paul et Mme. Martee Cans of Paris, Lt Cmdr M. Cheshire (former commander HMS Victory), Prof. Michel Malgorn. Every detail was a subject for re-evaluation & detailed discussion between the Artist & many experts in England, France and Spain, in particular Peter Goodwin, Keeper and Curator, HMS Victory. My interest in this period started when aged 13. My father gave his bored teen age son a copy of Midshipman Hornblower saying, I enjoyed this, see what you think of it”. My interest was fuelled when aged 18, with my Father, one of my college teachers, Martin Simmonds, tok us to Portsmouth for a Society of Nautical Research ‘silver service’ dinner, as guests of the Royal Navy, a dinner in Nelson’s cabin. How could I not be impressed? Part of the outcome is you have here exceptional insights, paintings for all our tomorrows, for our posterity. We hope you enjoy your visit here and let us know what you think. Are H.M.S. Victory and the battle of Trafalgar important? H.M.S. Victory is the only surviving ship of her type from a time when all major European countries had fleets of such ships. Trafalgar was a battle that effected / changed world history for over 100 years. More on this at the bottom of this page. 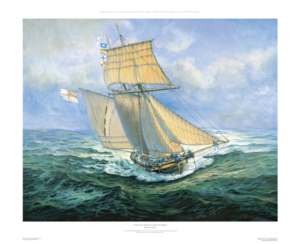 Two of Gordon Frickers’s Trafalgar paintings (“Trafalgar Dawn” and H.M. Schooner “Pickle”, carrying the news of the Battle of Trafalgar ) are available as limited edition prints. Click on an image below to see a larger image of, detail on, and archived information on the limited edition, or go to our Print Gallery to collect your print. 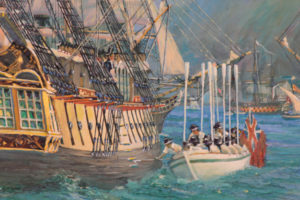 To see Gordon Fricker’s other Trafalgar paintings and sketches click on an image below to see a larger image of, and detail on, the painting, sketch or print. A selection of some of the best recent books on the subject are on offer below. “The ever to be lamented death of Vice Admiral Lord Viscount Nelson”, who, in the late conflict with the enemy, fell in the hour of victory, leaves to me the duty of informing my Lord Commissioners of the Admiralty, that on the 19th inst. it was communicated to the Commander in Chief from the ships watching the motions of the enemy in Cadiz, that the combined fleet had put to sea; as they sailed with light winds westerly, his Lordship concluded their destination was the Mediterranean, and immediately made all sail for the Straights’ entrance, with the British squadron, consisting of twenty-seven ships, three of them sixty-fours, where his Lordship was informed by Captain Blackwood (whose vigilance in watching, and giving notice of the enemy’s movements, has been highly meritorious) that they had not yet passed the Straights. ‘On Monday, the 21st instant, at day light, when Cape Trafalgar bore E. by S. about seven leagues, the enemy was discovered six or seven miles to the eastward, the wind about west, and very light, the Commander in Chief immediately made the signal for the fleet to bear up in two columns, as they are formed in order of sailing; a mode of attack his Lordship had previously directed, to avoid the inconvenience and delay in forming a line of battle in the usual manner. The enemy’s line consisted of thirty-three ships (of which 18 were French and 15 Spanish) commanded in chief by Admiral Villeneuve; the Spaniards under the direction of Gravina, wore, with their heads to the northward, and formed the line of battle with great closeness and correctness;-but as the mode of attack was unusual, so the structure of their line was new; it formed a crescent convexing to leeward-so that, in leading down to their centre, I had both their van and rear, abaft the beam; before the fire opened, every alternate ship was about a cable’s length to windward of her second a-head, and astern, forming a kind of double line, and appeared, when on their beam, to leave a very little interval between them; and this without crowding their ships. Admiral Villeneuve was in the Bucentaure in the centre, and the Prince of Asturias bore Gravina’s flag in the rear; but the French and Spanish ships were mixed without any apparent regard to order of national squadron. ‘As the mode of our attack had been previously determined on, and communicated to the Flag Officers and Captains, few signals were necessary, and none were made, except to direct close order as the lines bore down. The Commander in Chief in the Victory led the weather column, and the Royal Sovereign, which bore my flag, the lee. ‘The action began at twelve o’clock, by the heading ships of the columns breaking through the enemy’s line, the Commander in Chief about the tenth ship from the van, the Second in Command about the twelfth from the rear, leaving the van of the enemy unoccupied; the succeeding ships breaking through, in all parts, astern of their headers, and engaging the enemy at the muzzles of their guns: the conflict was severe; the enemy’s ships were fought with a gallantry highly honorable to their officers, but the attack on them was irresistible, and it pleased the Almighty Disposer of all Events, to grant his Majesty’s arms a complete and glorious victory. About three P.M. many of the enemy’s ships having struck their Colours, their line gave way: Admiral Gravina, with ten ships, joining their frigates to leeward, stood towards Cadiz. 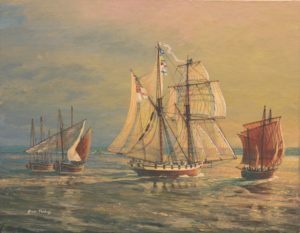 The five headmost ships in their van tacked, and standing to the southward, to windward, of the British line, were engaged, and the stern most of them taken:-the others went off, leaving to his Majesty’s squadron, nineteen ships of the line, (o which two are first-rates, the Santissima Trinidad and the Santa Anna) with three Flag Officers, viz. Admiral Villeneuve, the Commander in Chief, Don Ignatio Maria D’Aliva, Vice Admiral, and the Spanish Rear Admiral Don Bathazar Hidalgo Cisneros. ‘After such a victory it may appear unnecessary to enter into encomiums on the particular parts taken by the several Commanders the conclusion says more on the subject than I have language to express; the spirit which animated all was the same; when all exerted themselves zealously in their country’s service, all deserve that then high merits should stand recorded; and never was high merit more conspicuous than in the battle I have described. ‘The Achille (a French 74), after having surrendered, by some mismanagement of the Frenchmen took fire and blew up; two hundred of her men were saved by the tenders. ‘A circumstance occurred during the action, which so strongly marks the invincible spirit of British seamen, when engaging the enemies of their country, that I cannot resist the pleasure I have in making it known to their Lordships; the Temeraire was boarded by accident, or design, by a French ship on one side, and a Spaniard on the other; the contest was vigorous, but, in the end, the combined ensigns were torn from the poop, and the British hoisted in their places. ‘Such a battle could not be fought without sustaining a great loss of men. I have not only to lament in common with the British Navy, and the British Nation, in the fall of the Commander in Chief, the loss of a Hero, whose name will be immortal, and his memory ever dear to his country; but my heart is rent with the most poignant grief for the death of a friend, to whom, by many years intimacy, and a perfect knowledge of the virtues of his mind, which inspired ideas superior to the common race of men, I was bound by the strongest ties of affection; a grief to which even the glorious occasion in which he fell, does not bring the consolation which perhaps it ought; his Lordship received a musket ball in his left breast, about the middle of the action, and sent an officer to me immediately with his last farewell; and soon after expired. ‘I have also to lament the loss of those excellent officers, Captains Duff, of the Mars, and Cooke, of the Bellerophon; I have yet heard of no others. ‘I fear the numbers that have fallen will be found very great, when the returns come to me; but it having blown a gale of wind ever since the action, I have not yet had it in my power to collect any reports from the ships. 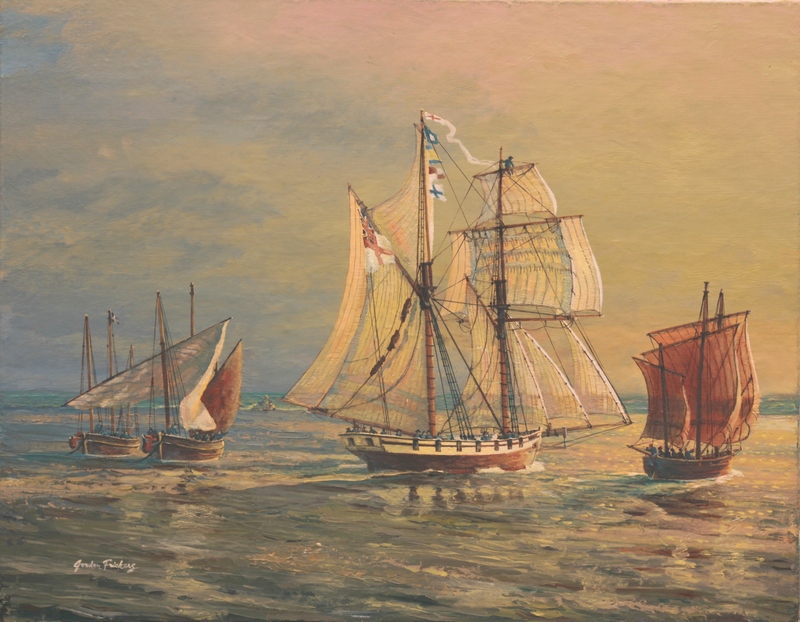 ‘The Royal Sovereign having lost her masts, except the tottering foremast, I called the Euryalus to me, while the action continued, which ship lying within hail, made my signals, a service Captain Blackwood performed with great attention; after the action, I shifted my flag to her, that I might more easily communicate my orders to, and collect the ships, and towed the Royal Sovereign out to seaward. The whole fleet were now in a very perilous situation, many dismasted, all shattered, in thirteen fathom water, off the Shoals of Trafalgar, and when I made the signal to prepare to anchor, few of the ships had an anchor to let go, their cables being shot; but the same good Providence which aided us through such a day, preserved us in the night, by the wind shifting a few points, and drifting the ships off the land. ‘Having thus detailed the proceedings of the fleet on this occasion, I beg to congratulate their Lordships on a victory, which, I hope will add a ray to the glory of his Majesty’s Crown, and be attended with public benefit to our country. San Sebastian Navel base and Museum, Cadiz. Museo Naval, Paseo del Prado, 5 – 28071, Madrid. Musee de la Marin, Palais de Chaillot, Paris. Musee de la Marine, la Châteaux, Brest. Gordon Frickers (C) ; 2005. It is as if only one castle or chateau survived from the medieval age. “Victory” took part in many of the famous actions of her day. A more distinguished ship would be hard to name. If from all the great “ships of the Line” (of battle) ships one sought an ideal ship to preserve, “Victory” would certainly soon be near if not on the top of your list. “Victory” was very sea worthy and for her type, fast but much more. Victory was and happily still is one of the biggest class of fighting ships in the age of sail, (1st rate, 100 + guns) H.M.S. “Victory” is the only surviving ship of her type. “Victory” was ordered by the Navy Board on the 6th of June 1759 and launched on the 7th May 1765, “Victory” flew the flag of many of Britain’s most famous Admirals, Keppel, Hood, Jervis, and including Horatio Nelson. After Nelson other great names flew their flag from “Victory”, with Saumarez was active in the Baltic, and she remains a flagship to this day. How many lesser men served her? We can only guess. During 35 years of continuous war, a chain of events starting for Great Britain with the “Jumonville Glen” incident in 1754. Primarily through the labour of the Royal Navy, Britain became the dominant Global Super Power. “Victory” is typical of the most powerful class of ship from that period and one of the finest ever built. “Victory” also represents wooden ship building as it approached it’s zenith in design, construction, technology, she was technologically advanced for her time in many ways). Today we can visit “Victory” at Portsmouth Royal Dockyard and see how under the skilful, learned guidance of her former curator and keeper Peter Goodwin, the Georgian navy fully integrated industrial inventiveness. We are lucky to have her with us today. Are H.M.S. Victory and the battle of Trafalgar important? A selection of some of the best recent books on the subject are on offer below. It’s for you to decide. Chris Fagg a long time ship mate of mine, on seeing my post on Facebook 14.10.2018, below ‘Nelson and the Minerve‘, asked a classic ‘Nelson’ question so I’ll share with you for discussion if you wish, my answer. Q : What were #Nelson‘s last words ‘#Kizmet or Kiss me’? However the kiss / kizmet controversy remains. I have never seen a statement by some one present that Nelson said ‘kiss’, or that Captain Hardy did kiss the dying Nelson. That doesn’t mean such a statement does not exist. Despite your opinion Chris Fagg of my age and ‘wisdom’, I was not with Nelson when he died. That was a rather busy day for all present. The late Dr Colin White, for many years curator of the Royal Navy Museum, Portsmouth, who I knew quite well including as a drink navy rum companion, was of the opinion Nelson said ‘kiss me’. Then again, Colin was a homosexual so maybe just a teeny bit biased? My own view having read extensively about Nelson, delivered 10 interactive public talks on ‘Nelson as a Role Model’, [I still have my notes] and discussed him with many people is he was most likely to have said ‘kizmet’ [fate]. Nelson had a considerable sense of destiny, knew Trafalgar would be the last really decisive naval battle of the Napoleonic Wars and knew he was loosing his sight, so I’d opt for ‘kizmet’. However, as men of his time went, he was a warm hearted fellow, considerate of others, tremendously brave [on the eve of Trafalgar he is quoted as saying “this will be my 106th action”]. Tough real men many of whom openly blubbered when they learnt of his death, so Colin might be correct. This would be a good question for my colleague and friend the husband of Katy Goodwin, Peter, who was curator of HMS Victory and is an active, distinguished naval author. Maybe for Philip Allan who unlike Peter, is on Facebook. 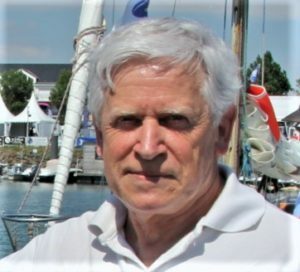 Philip is also an impressively knowledgeable person, naval authority and author. Look closely and you will see Nelson sitting on the stern sheets of the barge detail show here. By the way, the painting is now available for exhibition as are all the as yet unsold paintings in that remarkable collection. To date the set have only been shown once. A private ‘soiree’ at the Army and Navy Club, St James, Pall Mall, London. Beautiful presented by Rochay Elite of Pall Mall, the paintings looked so fabulous they even surprised me. He was an American naval officer and historian who was a highly influential exponent of sea power in the late 19th and early 20th centuries. He sought to arouse his fellow Americans to a realisation of their maritime responsibilities. Still one of the best history’s on the subject, I treasure my second edition  copy.